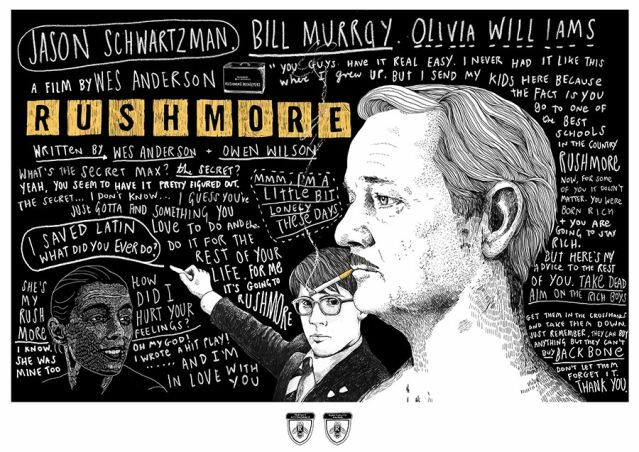 Rushmore – Did You See That One? Max Fischer (Schwartzman) is the king of Rushmore preparatory school. His commitment to the extra-curricular activities goes above and beyond. Unfortunately, this commitment forces Max onto academic probation. Director Wes Anderson (The Grand Budapest Hotel) found new levels of success with Rushmore, his second feature film. This story was co-written by Anderson and Owen Wilson (Midnight in Paris). The cast included an unknown Jason Schwartman (Saving Mr. Banks) and relative newcomer Olivia Williams (An Education). Bill Murray (Moonrise Kingdom) is also featured in a role that helped breathe new life into his career. This is a great example of the evolution of Wes Anderson’s style of storytelling. The willingness to ignore convention might be a distraction in some films, but this story works nicely. The unique construction of each character is what really drives this one. Every single character has major flaws that seem to motivate most of their choices. The comedy that stems from these people is wonderfully written. Like most of Anderson’s work, this movie also finds wonderful ways to work with the more common situations in life. This really helps to make sure that the more outrageous moments stand out. The dialogue is also nicely written, with a deliberate feeling that seems to choose every word carefully. All of these elements come together wonderfully in this unique film. Good writing needs good acting to elevate it. This film doesn’t disappoint in the acting department. Jason Schwartzman made the most of his first feature film opportunity and created the perfect Max. His character is wise beyond his years and incredibly dense all at once. Schwartzman was able to latch onto these qualities and bring them out in a great performance. He also has a unique and awesome chemistry with Bill Murray. Murray also has a uniquely flawed character to work with. In many ways he’s playing an older version of Max. Their competing interests in the film create some great moments. Olivia Williams was cast in a role that’s far less flawed than the other main characters. Her work with Schwartzman and Murray creates good chemistry and some fun moments. Overall, this trio of actors comes together and makes this film work nicely. The rest of the cast is also great at filling in the world that Wes Anderson created. The unique visuals in this film are another nice example of the teamwork between Anderson and cinematographer Robert Yeoman (Bridesmaids). Like the carefully designed dialogue, the cinematography seems carefully planned. The attention to detail pays off, and makes this a film worth watching more than once. (There are a number of minor details to take in.) The addition of great costuming and production design further the creation if this setting and make this a great movie to see. Overall, this is a movie that Wes Anderson fans have likely seen many times. If you missed this one, it’s time to get to it. This is also good film for fans of goofy or quirky comedies. I would also suggest this to fans of any of the stars in the film. I give this one 4.5 out of 5 stars. My absolute favorite Wes Anderson. I just love Max. Pingback: Man Up | Did You See That One? Pingback: Isle of Dogs – Did You See That One?